This guide covers all the basic information of owning any species of land hermit crab. For more specific information pertaining to each species, please see our individual Species Care Sheets linked directly below. The FAQs and Articles in the Care Sheet subforum have more in-depth coverage about all of the aspects of hermit crab care that are covered here, and links have been provided where applicable. Much more detail father down and in the other FAQs and guides! Lifespan: Up to 40 years is possible in captivity though 10 to 20 years is more common. In the wild, 50 to 70 years has been reported. Size: Young crabs (under 2 years) are 0.5 inches across and can fit on a dime. Full grown adults (25+ years) reach 6 inches and are larger than a softball. Average size (5 to 15 years) is 2 to 3 inches. Housing: Minimum 10 gallon aquarium for small crabs, with larger tanks required as they grow. Minimum 75 gallon aquarium when fully grown. Wire cages and open topped enclosures do not hold in heat or humidity and should not be used in non-tropical areas. Climate: 80 to 85 degrees and humidity levels of at least 75%. Purple Pinchers can handle slightly lower temperatures down to 75 degrees. Substrate: Children's Playsand (silica based) or cocofiber, or a mix of the two, and many crabbers prefer a 5:1 mixture of sand to cocofiber. Must be kept moistened, enough so the substrate keeps it's shape when squeezed but not so much it drips. Substrate must be at least four times deeper than the crab is big, which usually means filling the aquarium halfway. Water: Dechlorinated water must be used, and using a product that binds heavy metals is recommended. Water bowls should be deep enough for the crab to submerge with a way for them to safely climb back out. Both fresh and salt is required. Saltwater should only be mixed using a product for marine fish. Diet: Hermit crabs are omnivores and scavangers. Fruit and protein (meat, insects, seafood) should be provided daily. Vegetables and plant matter such as oak or maple leaves are welcome additions. Hermits are affected by pesticides and fertilizers, so care should be taken when sourcing food. Molting: Crabs molt to grow, which can take weeks or months. They will bury under the surface and not return topside until they are finished. This is why there is a need for such deep substrate! Never disturb a molting crab as digging it up may kill it. Shells: 3 to 5 shells per crab, and they must be a proper species of shell and slightly larger than what the crab is currently wearing. Please do not offer painted or glazed shells - they are dangerous and potentially toxic to hermits. Natural and polished shells can be found online and in craft stores. Breeding: Hermits do breed in captivity, but live young are not possible without special equipment and a lot of effort. Maintenance: Food should be changed daily to prevent mold growth. Water bowls should be changed when dirty or at least every third day. Spot clean as needed to remove waste and uneaten food. Glass can be cleaned with white vinegar as needed. Monitor substrate for signs of dryness and spray with freshwater as needed. Substrate almost never needs to be changed unless it becomes over saturated. If the tank is not over saturated and you feel strongly about changing it, please wait until all molting crabs are finished and on the surface for safety! I Bought a Crab, Now What?! There are many myths and inaccurate care sheets and advice out there, so please read on! Hermit crabs come from tropical regions; therefore, they have a few easy, yet essential requirements for their “home away from home” - which we call a crabitat. Once these basic requirements are met, you will find hermit crabs to be a relatively simple yet rewarding pet to care for. This care sheet and other articles on our site will help you to understand what those needs are, and will help you to set up a home for your new hermit crab. Hermit crabs can live for decades with proper care, so giving them the perfect home is important. While the name implies they like to be alone, that is far from the case! In the wild, hermit crabs travel in colonies that number in the hundreds. Most hermit crabs benefit greatly from having friends—in fact, it’s very important for them to have the company of their own kind. You’ll also be able to watch them interact, and their behavior in the presence of other crabs is closer to what it would normally be in nature. Size does not matter to a hermit crab, so feel free to mix tiny crabs with jumbos. Crab companions should only be other hermit crabs though; do not place them in the same enclosure as other reptiles, amphibians, or mammals. A healthy crab can be seen walking and waving its antennae happily, either on its own or when you pick it up (hold your hand flat so it can’t pinch!). Crabs in natural shells are usually healthier than crabs that were forced into painted or decorated shells. Most crabs dump their painted shell first chance they get. New crabs can be kept in a separate ISO tank for a few weeks to a month – both to help them graduate to the improved conditions, and to prevent introducing crab mites to your current hermit crabs. Many crabbers choose to add new crabs immediately to their main tank. New crabs should be bathed at least once before upon coming home to make sure they do not have mites. When introducing new crabs to the main tank, give them a dip in tank temperature declorinated fresh water which will make them smell familiar to the other crabs. It can help to prevent any bullying or fights with your existing crabs, and make the introductions go much smoother. All hermit crabs are wild caught, and not all make the transition from life in the wild to life in captivity. They also take a very long journey from the tropics in less than good conditions to reach the stores where they are sold. Some hermit crabs will start to slow down and may unexpectedly die after being bought. This is known as Post Purchase Syndrome. Any crab that is new is at risk of sudden death until it has completed its first successful molt in captivity. All land hermit crab species except the giant coconut crab begin with the name Coenobita (C.). They are born in the ocean, but quickly transition to life on land and live on ocean beaches as well as further inland in tropical rainforests near the coast. Do not confuse them with marine hermit crabs, which spend their whole lives in the ocean and only emerge at low tide to forage. The most common species of land crab in captivity are the Purple Pincher (C. Clypeatus), which has a big purple pincher with light-orange to dark-red legs, and the Ecuadorian (C. Compressus) which has smaller claws, gray-green to tan coloring, and big eyes that look like “()”. Ruggies (C. Rugosus), Indos (C. Brevimanus), Violas (C. Violascens) , and Strawberries (C. Perlatus) may be found at some pet stores, but they are a rarity to find for sale. Different species can be mixed together, but you should have at least two of each species so that they have a "species buddy". Most new owners purchase a hermit crab in a small plastic container usually referred to as a critter keeper. While these cages are good for an isolation tank and temporary lodging, they aren’t large enough for everyday living. By the time the dishes for food and water, the deep substrate they need, and fun decorations are added, there’s no room left for the crab! Aquariums are a way to give your crab more space to live, and also give you more room to decorate. These can be purchased new, but since the aquarium doesn’t have to be watertight you can buy a used tank at a reasonable price instead. Another option is to use large plastic storage containers or very large acrylic animal cages—these are an extremely inexpensive way to give your hermit crabs a large living area. Remember that the more crabs you have, the more space they need, especially when they start growing! Every crab needs enough room to molt safely and to have their own space to get away from the other crabs if they feel the need. For a medium crab, the minimum necessary size is a 10 gallon glass aquarium. For long-term housing, each crab needs at least 5 gallons of space and even more than that as they grow bigger. Hermit crabs move around and exercise a lot more than you may think since they are most active at night, and they will stay healthier with a larger enclosure. For a baseball-sized crab, a 75 gallon or larger tank is the best possible home. Please keep in mind that hermit crabs can be overcrowded, and that every crab needs to be able to have it's own space to molt safely. Some hermits can grow very quickly, so that tiny crab in a 10 gallon tank could be a very large crab needing a larger tank in a year or two! Hermit crabs are expert climbers and are stronger than they look, so a lid should always be used. Lids will also hold in the heat and humidity that hermit crabs require. Aquarium hoods and glass lids are best when used in conjunction with heating mats, although any openings should be covered and secured with duct or packing tape. Reptile screen lids are perfect for use with heat lamps, though you may need to cover the areas around the lamp with plastic wrap or aluminium foil to maintain a high humidity level. Lid clips are available for use with screen lids; these clips prevent escapes while still allowing for easy access. Plexi-glass can be used instead of glass, but please keep in mind that it is plastic and can melt or give off toxic fumes if it is allowed to get too hot. More information: Tank Size, Crab Size & How Many Can You Have? 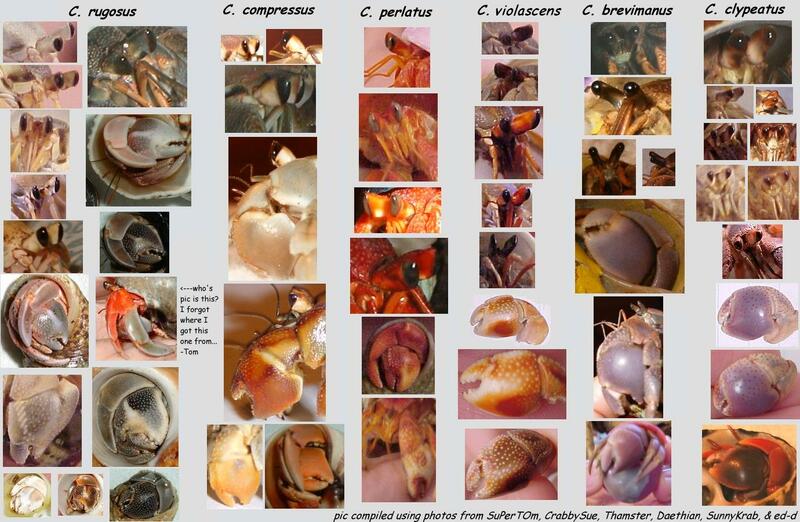 Hermit crabs breathe using modified gills: not quite fish gills; not quite human lungs. Their gills must remain moist at all times or they will slowly suffocate. It is therefore essential that their crabitat have sufficient humidity. A humidity gauge, which can be purchased with reptile supplies or in the home and garden section of most stores, is one of the most important crab supplies. Ideal humidity is between 70% and 85%, and by contrast most houses are only at 40-50%. Do not allow your crabs to be exposed to humidity levels below 65% for extended periods of time. Levels above 80% are safe for hermits but may encourage mold growth. Never guess on what the humidity is in your crabitat! Making sure the humidity level is ideal is important to your crab’s wellbeing. Getting the humidity above 70% can be tricky at first. Keeping the humidity high may also be a challenge if you run an A/C in the summer, and when the furnace is on in the winter. Misting with freshwater is the most common way of raising the humidity level, but if it is the only method used it may need to be done a few times per day. The tank and lid should be mostly sealed to keep the humid air from escaping, but make sure to leave some vents for fresh air to enter the tank as hermit crabs do breathe oxygen and low levels may cause health problems. Using large water bowls often helps with humidity, as the heat lamps or UTH will evaporate the water to increase humidity. Using moist reptile moss will also help with keeping the humidity stable, and the crabs will enjoy having a 'moss pit' to hang out in. However, the key to keeping humidity up is a moist substrate, so watch closely and make sure it isn't drying out. Using more cocofiber will also increase the amount of humidity in the tank. For serious crabbers with humidity problems, try a reptile fogger or humidifier - many models come with timers and are very easy to set-up and use to keep your humidity stable! Since they are from the tropics, Purple Pincher hermit crabs need to be kept between 75 and 85 degrees. Exotic species such as Ecuadorians need higher temperatures of 80 to 85 degrees. If your home is not this warm during the summer or winter, there are options to help! Products made for tropical reptiles are perfect for helping to replicate a hermit crab’s native environment. If the temperature falls below 70 degrees for too long, they begin to go dormant, and may not survive. A thermometer should always be used to monitor temperatures in case of a heating failure. These are the most popular option for warming crabitats. They are sold for reptiles for use underneath the tank, but in hermit crab enclosures the UTH should only be used on the side or back of the tank. Because of the need of thick substrate in crabitats, UTHs are not effective when used on the bottom and can possibly overheat and become a fire risk. Do not pay attention to the recommended tank size on the packaging - buy the largest sized heat mat that you can fit on the back of your tank as many store-bought UTH run too cool to heat a crabitat. Ultratherm brand UTH must be ordered online, but they are known to run the warmest and are capable of being insulated with styrofoam to boost the heat unlike many other brands. If the UTH runs too warm a plug-in lamp dimmer or thermostat can be used to adjust the temperature. Many crabbers prefer to use a pad that ends above the substrate line so that they do not have to worry about substrate drying out quickly. Also, UTH cannot be bent without damaging them. Heat lamps are an option that will provide a lot of heat, which is great if your house is kept on the cooler side. There are many types of heat lamps to choose from, and the larger the dome the more heat will be reflected into the enclosure. It can be difficult to find the right wattage of bulb to get the enclosure to the right temperature, so a rheostat (plug-in lamp dimmer) or dimmable clamp lamp can be very beneficial when using heat bulbs, as this will allow you to cool down and adjust a lamp that is running too hot. Small 10 gallon tanks may need to start out with a 25w bulb while large tanks may need more than 100w. Hermit crabs are nocturnal and need to have darkness at night, so special reptile bulbs (moonglow, infrared or ceramic) are the best as they can be kept on all night long. However, do not use blacklights or party lights, as these emit lots of UVA and are quite different from reptile bulbs. Heat rocks can burn your hermits, and heat cables can be pinched through causing an electrical hazard. Daylight heating bulbs can be used during daylight hours only, but watch to make sure that the crabitat doesn’t cool off too low at night. Florescent and UVB bulbs will give you viewing light during the day but will have very little effect on the temperature. If the room they are in stays warm enough, you may not need to add any supplemental heat. Hermit crabs grow by molting: during this time they tunnel underground and shed their hard exoskeleton, revealing a very soft new skin that hardens over a period of days. They also bury to destress, or for fun, or if conditions in the crabitat aren't good. For substrate, a mix of regular silica-based children's playsand from the hardware store with either loose or compressed cocofiber from the pet store works the best. Playsand comes sterilized, washed, and screened, so it is ready for use right from the bag and it costs just a few dollars for enough to fill the entire tank. Cocofiber holds and releases a lot of moisture, so it is a wonderful way to increase the humidity of a tank. Most crabbers will recommend a mix of 5 parts sand to 1 part cocofiber, and you can also add in small amounts of crushed coral or organic worm castings. Fluker’s Farms has recently come out with a hermit crab sand that is made of cocofiber and silica sand—this is the only hermit crab branded sand that is safe. 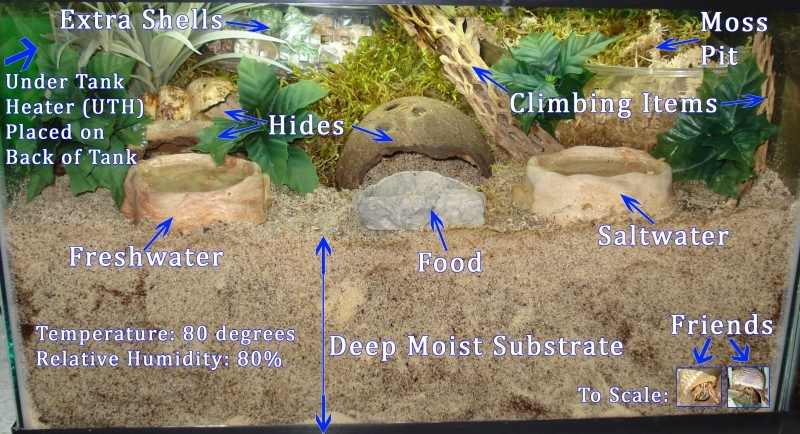 Substrate must always be kept moist. When wetting substrate, make sure that the water has been treated with dechlorinator to make it safe. Sand should be moistened to the point where it just holds its shape and you could build sand-castles with it. Cocofiber should be kept on the dryer side where it is damp enough to hold its shape but no water drips out when it’s squeezed. For substrate that stays fresh for a long time and resists mold growth, you can use regular strength salt water when wetting it down the first time. The salt helps the humidity levels stay high, and it will also help to prevent mold from growing. Always use freshwater to rewet the sand, as the salt will stay in the substrate and adding in more can make it become too salty over time. Hard and chunky substrates like gravel and mulch should never be used with hermit crabs since these substances are hard to dig into and will not hold tunnels or caves. Calcium sands should not be user either as it smells bad when wet, is porous which allows bad bacterial growth, is sticky which can encrust their legs and abdomens, and when it starts to dry out it can harden into a cement like block. Hermit crabs have a soft, delicate abdomen and in order to keep it protected they wear shells on their backs. These shells are not a physical part of the crab, rather they are borrowed from other shellfish. As the crab grows, it will need to move into bigger and bigger shells. Some crabs just love to change shells for fun, or to find a better fit. Always have a broad selection of different sizes as some hermit crabs like to wear shells that seem too large or too small for them. The more hermit crabs you have, the more shells you should have available. If a crab does not have enough shell choices, he may try to force another crab out of its shell and steal it. Neither you (nor another crab!) should ever try to force a crab out of its shell. New shells should be sterilized in boiling dechlorinated water for five minutes and allowed to cool before being given to your crabs. Individual crabs and some species like Ecuadorians will often be stubborn about changing, so as long as you have provided proper sizes and proper shell species, it is okay if your crab does not change shells - it just means he's happy with what he has! You should provide at least three to five shells of each size needed by your crabs. The perfect sized shell has a circular or oval shaped opening the size of the crab’s big pincher; however, some crabs enjoy shells that are either too big or too small for them. Crabs cannot fit their bodies into shells that have thin openings. Each species has its own likes when it comes to shell species, so it's a good idea to research what they may enjoy the most before shopping for new shells. While painted shells are very pretty, the paint itself is toxic to the crabs and they should be avoided. Natural shells are very beautiful, and there are many different types of shells that hermits enjoy wearing. There are online shops that sell natural shells, and some craft stores carry them as well. All water going into the hermit crab tank needs to be dechlorinated—for drinking, misting, cleaning, or wetting substrate. Any fish or reptile dechlorinator that removes chlorine, chloramine, and heavy metals will be perfect. Letting water sit for 24 hours or using plain dechlorinators will only remove chlorine, and does not remove the more harmful chloramines and heavy metal ions. Bottled natural spring water is also okay as long as you are sure it is completely natural as many bottled waters are just tap water with a fancy name on the label. There is some concern that distilled or reverse osmosis (RO) water may not have all the minerals crabs need, but supplying properly mixed salt water this shouldn’t be a problem. Hermit crabs require two types of water—fresh water and ocean water. Providing them with both salt and fresh water allows them to regulate their salinity themselves, which is essential for maintaining their shell water and health. Their dishes should be deep enough for them to completely submerge so they can self-bathe whenever they feel the need. Hermit crabs will go swimming if given the chance, but whatever container you use must have a way for the crabs to climb back out as they will drown if trapped underwater for too long. Hermit crabs live on beaches, and thus require a source of salt-water. Do not use table salt however – it contains only sodium chloride and also has chemicals to keep it from clumping that may harmful. Always use a marine salt mix, which is sold with salt-water fish supplies. Marine salt contains nearly 70 different elements and minerals and will perfectly mimic sea water. The most commonly found brand is Instant Ocean, and this is available in small boxes and larger bags. Please note that while salt sold for freshwater aquariums and (ironically) specifically for hermit crabs are not dangerous, they do not contain the extra elements needed and should not be used. You will need to dechlorinate the water used with the salt mix. Hermit crabs do not need to be bathed. Crabs carry water in their shells at all times, and each crab likes to have its own personal mix of salt and fresh water. Bathing them ruins this mixture and can also stress them. The activity that occurs during and after a bath is a sign that they are frightened and are panicking. In the wild, crabs are scavengers and will eat just about everything they come by, from plants to dead animals - but this doesn’t mean you can just feed junk to your hermit crabs! Not many commercial foods are recommended as they contain preservatives such as ethoxyquin and/or copper sulfate which pose long-term health risks, or contain unnecessary chemicals. As a staple diet, you should feed your crabs a variety of fresh or dried fruits and vegetables, whole grain foods, egg, meat, fish, poultry, other seafood, and also dried insects. Calcium powder, crushed coral and shells, crushed cuttlebone or eggshells should be provided at all times to help their exoskeleton stay strong. Crabs love to climb, exercise, and practice acrobatics - some species are known as 'tree crabs' as they are found climbing trees in the wild. Providing climbing items is essential for their comfort. Cholla wood, cork bark, mopani, drfitwood and large coral can be found in pet stores and these items are easy to climb and they make a good snack! Safe woods can be collected for free from your yard as well if they have not been exposed to pesticides and fertilizers. Explore ways of creating second levels for your crabs, as this will give them high areas to hang out in, and also increase the square footage of your tank. Each crab needs their own little “spot” – a safe place to retreat to for resting and to relieve stress. You’ll need to provide some type of shelter, such as a hollow half-log, plastic cave, or coco-hut. Crabs will also hide behind fake plants. You should have enough hiding spaces for each crab, otherwise your crabitat may be too crowded and this will stress the crabs. The more plants and shelters they have to hide in, the safer they will feel and the more you will see them. Insufficient shelter can cause hermits to bury underground more often. Anything sold for reptiles and fish is generally recognized as also being crab safe. You can also find natural wood and fake plants at craft stores and dollar stores. Watch to make sure that whatever you are using is non-toxic and isn’t make of a material where the crabs can pinch off paint or parts of it. Crabs will pinch and destroy anything they can get their claws on! Crabs should not have contact with anything chrome, as chromium ions are dangerous. Nickel, arsenic, and cadmium are also dangerous. Don’t use Spanish or decorative moss, as this is actually colored pine shavings, or craft moss as it may have pesticides. Also, be aware that iron will rust in the high humidity. Hermit crabs grow and heal by molting, and during this time it is very important not to dig up or disturb your crab. When a crab is molting they spend that entire time underground without surfacing—not even to eat or drink. Unfortunately it’s a very boring time for us owners! A deep, moist, diggable substrate is essential to a successful molt. Your crab will likely completely bury for several weeks or months as they need the dark seclusion of the underground for their molting hormone (Ecdysone) to work. The water pressure maintained with the moist substrate allows them to bust out of their exoskeleton. If crabs are prevented from burying in moist substrate, or are regularly dug up, they can build up a molt-inhibiting hormone (Xanthurenic acid) which can have dire effects. The time it takes for a crab to molt is determined by the size of crab and also by the crab itself, so there is no way of knowing just how long it will take. Smaller crabs generally molt faster and more often than larger ones. The time spent underground can be anywhere from 3 weeks to 3 months, sometimes longer. Small crabs can molt once a month, while jumbo crabs may wait 12 to 18 months between molts. During this period they will find a safe and quiet place under the substrate to build themselves a little cave. They will then shed their exoskeleton (skin), which will look exactly like the front-half of a crab, but will be empty inside. Once the exoskeleton is off and they’ve have a few hours to a few days to harden up the new skin, they’ll start eating their old exoskeleton to reabsorb the lost minerals and to help strengthen their new exoskeleton. They’ll then rest underground until they are completely hardened up and are ready to return to the surface. Some warning signs that a molt may happen soon include the crab having an ashy or grayish appearance, blurry or cloudy eyes, confused antennae, the growth of a molting sac (looks like a black jelly bean just behind their back left leg), digging more often than usual, eating more than usual, and spending a lot of time around the water dish. Some crabs give off no signs at all. If a crab is missing a limb, you might see a small ball of clear gel begin to grow, this is called a gel limb, and is a sign that it will regenerate with the next molt. Sometimes a crab will shed it’s exoskeleton without burying underground. This is called a surface molt. These are very dangerous for a crab and are usually a sign that something is wrong with their enclosure. If this ever happens, stay calm! Do not touch the crab as this can injure them. Cover the crab with a hide or other object that will block out light, and make sure any other crabs you have cannot get to the molter. The molting crab should be able to finish eating his exoskeleton and can join the other crabs once he’s moving around and eating normal food again. You can also isolate him in the tank with the top-half of a plastic bottle (with the cap open for air) to prevent other crabs from bothering him. If you pick up a surface molter, the exo may look like a dead crab falling out. Check way back in the shell for a newly molted crab before starting the funeral! He will need to eat the old exoskeleton in order to regain the lost calcium and nutrients, so don’t take it away. Hermit crabs can regrow entire body parts when they molt. Limbs, pinchers, antennas and even eyes can reform in one molt or over a span of several molts. Hermit crabs who have been attacked and lost all their limbs have successfully survived by being cared for until they were able to molt again. Newly grown legs are often skinny and brightly colored, and new pinchers will be undersized, but usually within two molts they will be back to looking normal. Injuries can also be repaired while molting. Hermit crabs can breed in captivity, and it's a sign of a healthy cabitat and happy hermit crabs. There is a good dose of luck involved as you must have two mature individuals of the opposite gender, which not all crabitats will have. Mature females are around medium in size, and the largest of males will win the fights for the right to mate with them. In the wild they have very set molting schedules of once per year, but in North America, captive crabs seem to breed between February and August with the most reports occurring in June and July. Eggs are ready to hatch roughly a month after mating occurs, and you may or may not see signs of the zoea in the water dish or eggs spread around the enclosure as the mother and other hermit crabs will eat them. It is almost impossible to rear young hermit crabs. Their larvae are ocean plankton for weeks after hatching, and it takes specialized equipment and a lot of time and effort to get any to survive in captivity. Only a few people have ever managed this successfully, and several have tried. We hope that more owners will try in the future as we learn more about the process. Someday we may be able to breed hermit crabs readily in captivity, and hopefully there will be no more need for wild harvesting. Assuming you provide your crabbies with a proper environment, they require relatively low maintenance. You should check the temperature and humidity every day and make adjustments as necessary. For instance, if the humidity is too high, you can prop open the glass cover a bit, or remove a small amount of saran wrap from the mesh. If the humidity is too low, you can prop the cover less, add more saran wrap, or check to make sure the substrate is staying moist enough. You should also remove any fresh food from the previous day to prevent spoilage, and make sure the water dishes are full and clean. Keeping the water clean is of utmost importance, as crabs can be very sensitive to water quality. Every week, you need to completely clean out the water and food bowls.. If you have large water basins that are filtered and aerated, they still need to be completely cleaned once a month unless they are cycled. You can also spot-clean poo from the tank, although if your sand or coconut fiber is kept properly moist, beneficial microbes will naturally recycle the poo. In the past it was often recommended to completely change your substrate after a set period, but many crabbers now choose to wait until the crabitat actually needs such a deep cleaning rather than follow a set schedule. Many have been using the same substrate for years with no problems! If you feel the need, substrate can be fully removed and replaced with fresh, and some old substrate can be retained to mix into the new to retain a familiar scent and for the good things that might be in the substrate. Try to work around the times when your crabs are molting so that there isn't any risk to them. It’s never a bad idea every few months to wash items in the tank in hot water. Cholla, driftwood, and cork can be microwaved for a couple of minutes while wet to kill any bacteria or mold. Regular bathing used to be recommended, but it is no longer. Hermit crabs auto-regulate the salinity of their shell water (osmoregulation), and stock up before molting. Bathing disrupts their shell water and can stress them, plus you should never dig up buried crabs. Provided the proper fresh and salt water bowls, they will clean themselves. The only time baths should be considered is when you are introducing two unfamiliar hermit crabs, adding a new crab into an established tank, or when one crab is getting picked on. Making the new or picked on crab smell neutral will often prevent or stop fights. If you use any organic climbing or hiding structures, like wood and wicker, don’t partially bury it in the moist substrate, or it may start to mold underground. Some mold growth is pretty much unavoidable in a crab tank, and while it's not good for us humans, it causes no health issues to the hermit crabs. Simply remove the affected items and clean them by boiling, baking, microwaving, or soaking in salt water. Allow wooden and natural items to dry completely before returning to help prevent mold from returning. Finding random insects and harmless mites in the crabitat is also extremely common. These things are already living in our homes, but the heat and humidity of the crab tank attracts them. In many cases cleaning the tank completely will do nothing to help as more are still present in the area and will come back once the tank is set back up. Springtails, isopods and food mites actually act as a living clean-up crew, breaking down waste and helping to prevent mold. Fruit flies can be dealt with using an easy an non-toxic vinegar trap. Permission granted to print, copy, and distribute this document as necessary to promote proper hermit crab care.